Clumsily worded and unnecessarily dramatic, Brisbane’s question pertained to something simpler: whether Times reporters should fact-check assertions made by subjects and sources in the text of the story. In other words, if a source makes a factually inaccurate assertion, should the journalist make clear to readers that it is, indeed, factually inaccurate? Readers were, in short, dumbfounded. For these readers, it was self-evident that holding the powerful to account and verifying their statements is the key journalistic activity. But these days, as I know from own my research, the very definition of journalism seems up for grabs, not least among journalists. And often, the difficulty in defining roles and assigning responsibilities in journalism is, in turn, getting in the way of a robust discussion of journalistic ethics. But we need to have one. What I want to consider here – with the presidential campaign kicking into high gear – is how Brisbane’s question should be applied to the moderators of televised presidential debates. For them, a shallow conception of objectivity as balance for its own sake – what press critic Jay Rosen describes as “the view from nowhere” – has led journalists away from the talisman of verification. For Rosen, objectivity as a process of evaluating competing claims akin to the scientific method has largely given way to a model defined by “neutrality,” where erroneous claims are “balanced” by another source. Rosen argues that the result of this journalism is that audiences are left with no idea who is right, as the task of sorting fact from spin or half-truth is left to them. Research indicates this is particularly problematic in coverage of issues like vaccinations and climate change. What, then, of debates – events characterized by the rapid exchange of claim and counterclaim? There has already been much comment about how these debates demonstrate that we live in a “post-fact” political world. When candidates link vaccines to “mental retardation” and autism, for example, what are moderators to do? 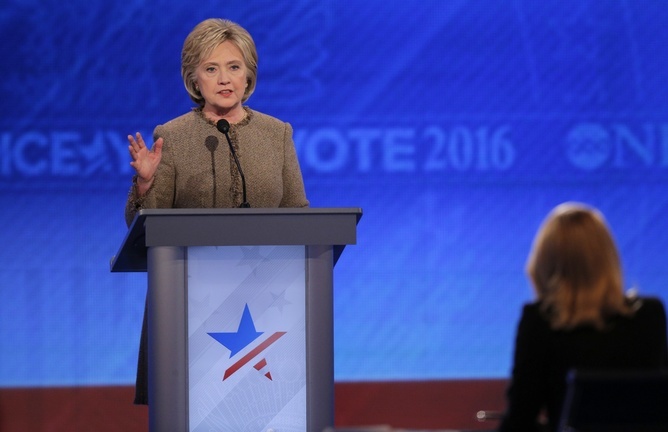 Should debate moderators be “truth vigilantes,” fact-checking statements in real time? The principle of verification would stipulate that the journalist moderators consistently and in real time check the facts. Hillary Clinton responds to ABC’s Martha Raddatz. Of course, there must be a process to follow. It should be consistent, applied to candidates within and across parties, so as to address the very serious fears about media partisanship. It should be in real time, or as close to real time as is reasonable, so assertions can be effectively challenged or clarified by the politicians. And it should focus on claims of fact, not claims of value. In other words, journalists must challenge only claims that are empirically false. It is clearly permissible for a candidate to describe something as desirable or undesirable based on how it conforms to their chosen ideology or worldview. Robust exchange of views is the essence of politics. It is something else entirely to ascribe characteristics or effects to something that are demonstrably untrue. This is, admittedly, no easy endeavor. It seems that candidates can get easy applause for lambasting journalists, while public trust in the media in the U.S. has reached an all-time low. Much of this distrust stems from widespread public belief about rampant partisan bias on the part of the media – belief that, it should be underlined, has weak empirical support. Yet, as a scholar concerned with the critical functions journalism fulfills in a democracy, I believe the moral imperative journalists bear in relation to the needs of audiences and to the democratic process overrides these concerns. Journalists moderating these events must function as journalists. Distrust in journalism is obviously concerning, but I suspect its causes lie elsewhere than rigorous adherence to verification. Preliminary research on a group of legislators in nine different states indicates that their awareness of “the electoral and reputational risks of having questionable statements exposed by fact-checkers” can reduce inaccuracies in candidate statements. Were rigorous, consistent, real-time fact-checking to become the new normal, the possibility exists that candidates could be more discrete in their pronouncements for fear of their reputation being harmed. A reasonable counterargument to real-time fact-checking may hold that there are other genres of journalism better suited to this process, such as organizations like PolitiFact, famous for rating public figures’ statements on a scale from “True” to “Pants on Fire.” Venerable organizations like PBS and CNN have followed suit with postdebate fact-checking operations of their own. Others may argue that this places absurdly high expectations on journalists in a high-stakes and often hostile environment, asking them to have a supply of facts at hand to rebut every possible erroneous statement. These objections hold little weight when scrutinized. Having separate organizations do the work of verification simply shifts it from one set of journalists to another, neglecting moderators’ obligations to audiences watching in real time. And the latter objection – that we shouldn’t expect so much from the moderators – sets a miserably low bar for journalists who ought to be at the top of their craft and who are, we should not forget, backed by teams of researchers and producers who can communicate with them during the live broadcast. If moderators choose not to function as journalists, there is little point in them being there. With seven Republican and three Democratic debates remaining, we are still in the midst of an eventful debate season. Hopefully we will see some proactive fact-checking in these debates. We could call it truth vigilantism. I’d prefer to call it journalism. Next Next post: Why do we pretend Supreme Court justices are anything but political officials?